Anyone who has been to a Peets, Starbucks, Coffee Bean & Tea Leaf or any other specialty coffee shop has certainly been exposed to some of the many different types of coffees available - all based on their origin (Columbian, Yemen Mocha, Jamaican Blue Mountain, etc.). But it's not only the soil and climate that influence the final product. I'm reminded of a day when we were tasting wines with an Australian winemaker here in our shop. I mentioned to him that I got an aroma of eucalyptus. He said "Funny you should mention that. We have eucalyptus trees planted all around our vineyard." If you read tasting notes about wines from southern France you will often find mentions of the smell of the garrigue in the wine. Garrigue is a term for the mix of wild shrubs (including lavender, rosemary and other plants) that generally grows there. You'll be amazed when you smell and taste the difference in chocolate from different regions - Venezuela, Ecuador, Hawaii - all have different traits. Chocolate from Ecuador, for instance, is generally known for its beautiful floral scents. 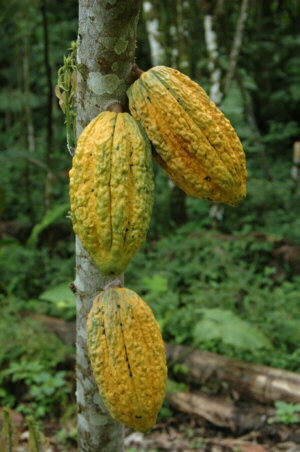 But we have held tastings here comparing the chocolate from three plantations in Ecuador and the difference was amazing. The first was rich in the typical Ecuadorian floral scents, the second greeted us with a delightful aroma of green bananas while the third beguiled us with delightful spices. All of this because of where the cacao was grown. Butters and cheeses reflect terroir as well. What kind of cow? What do they feed on? What is the climate? What are the naturally occurring yeasts and cultures in the area? Test this for yourself. Try some English butter, French butter, artisan American butter. Ooh - this is fun! How many hundreds of type of cheeses are there in France? The world has a lot of variety to offer and every place is in some way unique. And that's the idea of terroir.